The Elizabeth Class comprised six ships launched from 1769 to 1787. One of them was the HMS Berwick 1775, which fought the French at the Battle of Ushant (1778) and the Dutch at the Battle of Dogger Bank (1781). Captured during the French Revolutionary Wars, she served under the name Le Berwick with some success and at the start of the Napoleonic Wars until the British recaptured her at the Battle of Trafalgar. 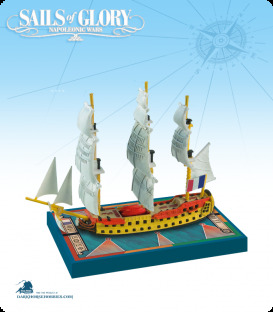 This ship pack can also be used to represent the French ship-of-the-line “Le Swiftsure 1801”.